The part of the territory of Norcia that boundaries on the courses of the rivers Nera, Sordo and Corno, as well as some areas in the mountains around Spoleto, is full of truffles - tartuffi, in Italian. Tuber melanosporum vittadini, common name "authentic black truffle", "Perigord truffle" or "Tartufo Nero Pregiato Umbro di Norcia" (rare black Umbrian truffle from Norcia), available from November to March, is black with shades from brown to purple to reddish with a whitish veining. Its size varies from few cm. in diameter to the size of an apple. Click here for vacation accommodation in and near Norcia. The availability of truffles in the areas around Norcia has had a distinctive and beneficial influence on local gastronomy. Unlike the white truffle, the black truffle needs to be heated up and/or cooked in order to add its flavour to the dish. To optimise the taste of the black truffle, it's best to prepare traditional dishes such the pasta dish ''strengozzi al tartufo''. The strengozzi are a type of homemade pasta, made from water and flour only, similar to thick and irregular fettuccine. The dish is prepared in a quite simple way, lightly frying the garlic and adding a pinch of Cayenne pepper in a generous amount of olive oil. Some variants call for addition of an anchovy. After washing, the truffle it is grated and added to the very hot oil for some minutes. and the oil is then added to the prepared strengozzi. However, don't wash the truffle too much - brush away as much dirt as possible dry, and then quickly clean off the remainder with water so as not to wash away the volatiles responsible for the aroma of the truffle. Black truffles are also delicious with simple spaghetti. This fair takes place in February, with the stalls almost totally dedicated to the truffle. The idea is to buy your truffles within a day or two of their having been in the ground and to eat them within another two days. Truffles rapidly lose their aroma once they have been dug up. 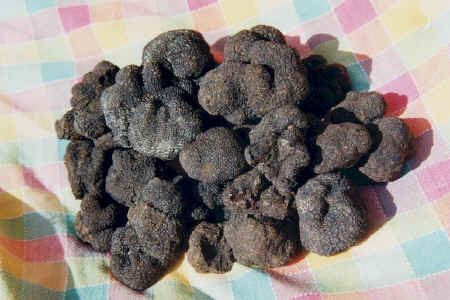 Click the following link for information about truffle fairs in and near San Miniato, Tuscany. Norcia Italy Copyright © ammonet InfoTech 2010 - 2018. All rights reserved.